Eating raw foods is a great way to cleanse your body as well as creating alignment with your soul, spirit and body. Start 2011 off right! 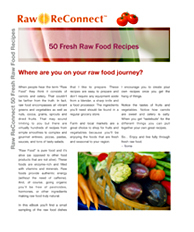 Download a *FREE* 3-Day Kickstart to Raw plan now by clicking here. I say thanks from the bottom of my heart for your precious time spent and assistance. I will entirely be grateful to you for this goodness. Please note that I am not a nutritionist and that my information is based soley on my own personal experience and should in no way be taken as medical advice. Please contact a health professional before starting this or any other program related to eating, health and body.